Thanks for watching my video on treble tatting. 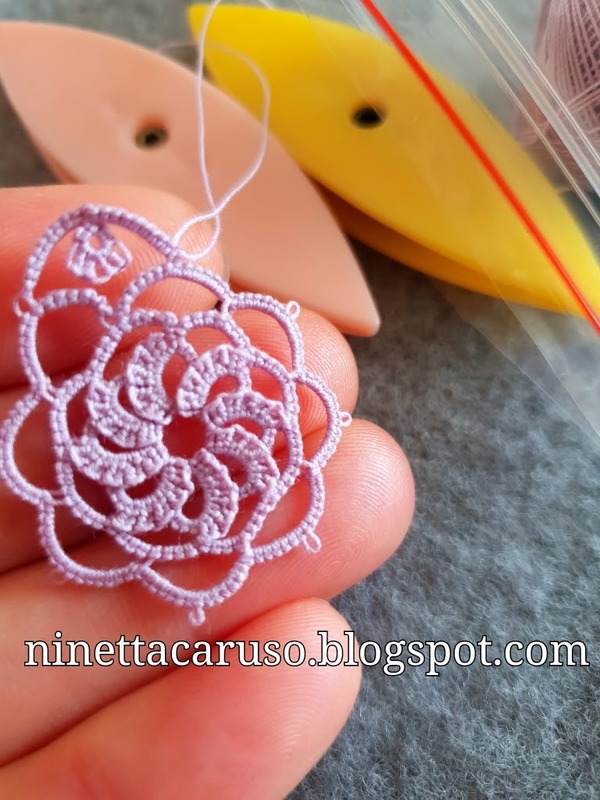 I'd love having feedback and pictures with your samples of treble tatting, please leave a comment with your link, so everybody can enjoy, thank you very much. half tatted with tds, the second half ring with ds. I've been playing with some ideas, not really patterns, yet. I'll post my ideas as they will come, please bear with me. There are a couple more test tatted little motifs but I haven't written patterns down, fingers crossed I won't forget it! But today I'd like posting my stitches' count for the first basic pattern, that is in the video. Start with a very small picot and one double stitch. Laying the picot across the ball thread and pull up a loop of thread through the picot. Then, take another loop of the ball thread and pull it through the previous loop. Now slip the shuttle through the loop thus formed. Don't tighten it, yet. Take a loop of the core thread in the ring finger, then pass the shuttle from back to front, through the loop, 3 times. Tighten the ball thread and don't let the core thread slip out of place. Then, pull the core thread. There is a second video, here: https://youtu.be/yRW-3qQGS_g , where I show you how I climbed out of a centre ring of 7 tds, with a faux tds. 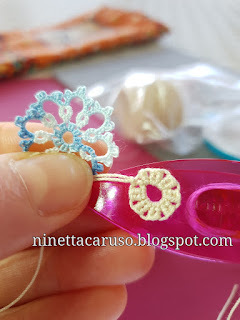 For the little light blue one, under my thumb, I used DMC Special Dentelles n. 80 colour 67 Aqua. Wind 1 shuttle and ball CTM (or 2 shuttles CTM), or use leftovers, unwinding all but the last meter. Ball thread could be added afterwords, if missing. 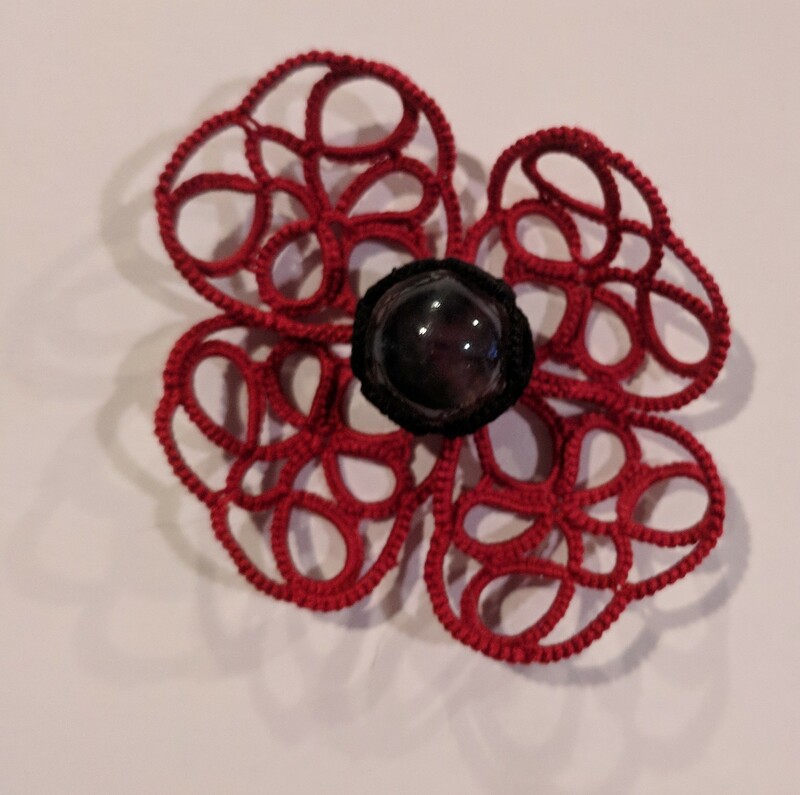 vsp = very small picot. Start with a ring: 1ds, 7tds, vsp , 1ds, then close ring and climb out of it with a "mock tds" (as showed in the second video). (tat the pattern clockwise) Chain: 2ds, 1tds, vsp, 2ds, 1tds, vsp, 2ds, 1tds, vsp, 2ds. Reverse work. Ring: 4ds, join to the space between two tds of the center, 4ds, close ring. Reverse work. Repeat Chain and Ring, ending with a chain. Tie and cut as per your usual way. My same old tip: have fun! I need your help to understand why my blog is listed in Feedspot with a wrong name. 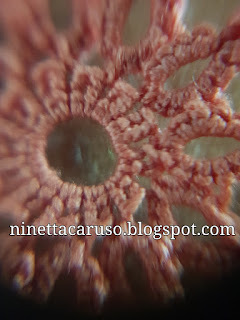 In fact it is there as "Ninetta" instead of "Chiacchierino facilissimo". I can't see where to send the correction and it seems that I only managed to create another entry with the same URL. Why they don't like the name I chose? Also, it is not clear to me the way they rank blogs, and please! please! please! don't let anyone make you pay for my patterns and tutorials that I give you free!